Never look directly at the sun without special viewing equipment. Looking directly at the sun can result in reduction of vision and including blindness. This damage is caused by the radiation emitted by the sun. Regular sunglasses and most welding masks will not protect the eyes from the radiation emitted by the sun. This being said there are several ways safe ways to view the eclipse. The first is to wear special eclipse glasses. These glasses have special solar filters that block the damaging radiation from the sun. The glasses must be compliant with the ISO 1231-2 standards. Homemade filters or ordinary sunglasses are NOT safe for viewing the sun. Before viewing the sun the eclipse glasses should be inspected for damage and scratches. If damaged it is not safe for the glasses to be used to view the sun. Eclipse glasses can be purchased in many places. It is important to note that even with the eclipse glasses you should not continuously look at the sun and it is recommended that you take breaks to rest your eyes. An alternative viewing method is to use pinhole projection. 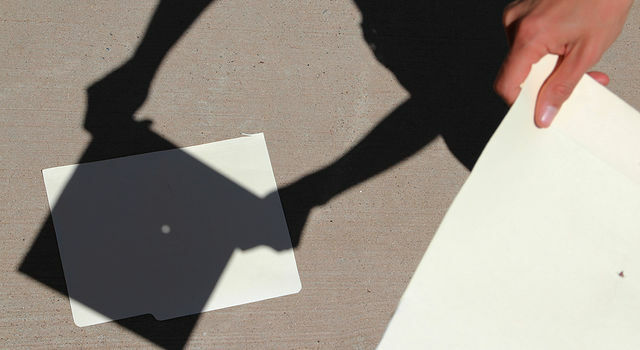 Pinhole projectors are a safe indirect viewing method that are popular for viewing solar eclipses. There many designs for Pinhole projectors, a simple pinhole projector can be made using 2 pieces of white card stock, aluminum foil, tape, and a pin or a paper clip. Strickland, Ashley. “Can You Really Go Blind Staring at an Eclipse?” CNN, Cable News Network, 11 Aug. 2017, www.cnn.com/2017/08/10/health/how-to-safely-watch-the-eclipse/index.html. “Eclipse 101.” NASA, NASA, https://eclipse2017.nasa.gov/safety. “How to Make a Pinhole Camera Project | NASA/JPL Edu.” NASA, NASA, 14 July 2016, www.jpl.nasa.gov/edu/learn/project/how-to-make-a-pinhole-camera/.